Welcome to the Webpage of the Dominican Church in Tralee, Co. Kerry, Ireland. The Order has been in Tralee since 1243. The present Church has been in situ since 1866. 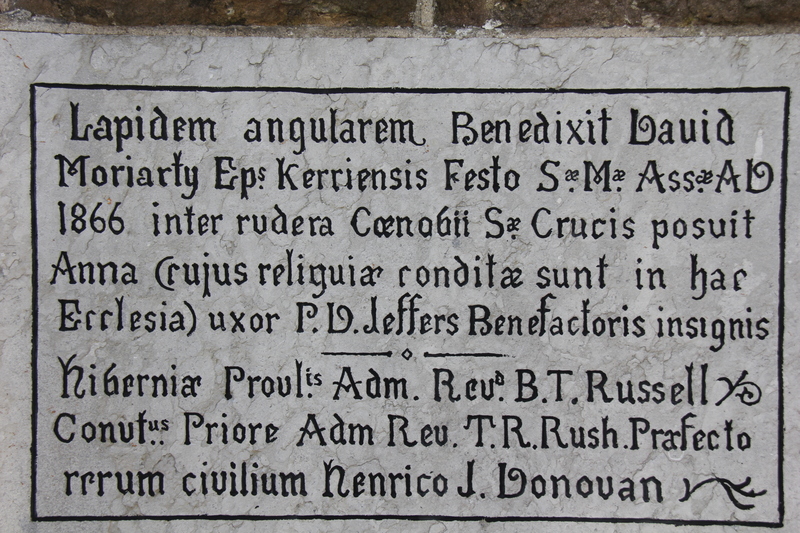 Please click here to see the original foundation stone. Over the years the many people have come to the Church to pray and to worship. The Church had its restoration period in the mid 1800's when the Dominican Fathers preached a Parish Mission in the Parish church of St John's in Castle Street. 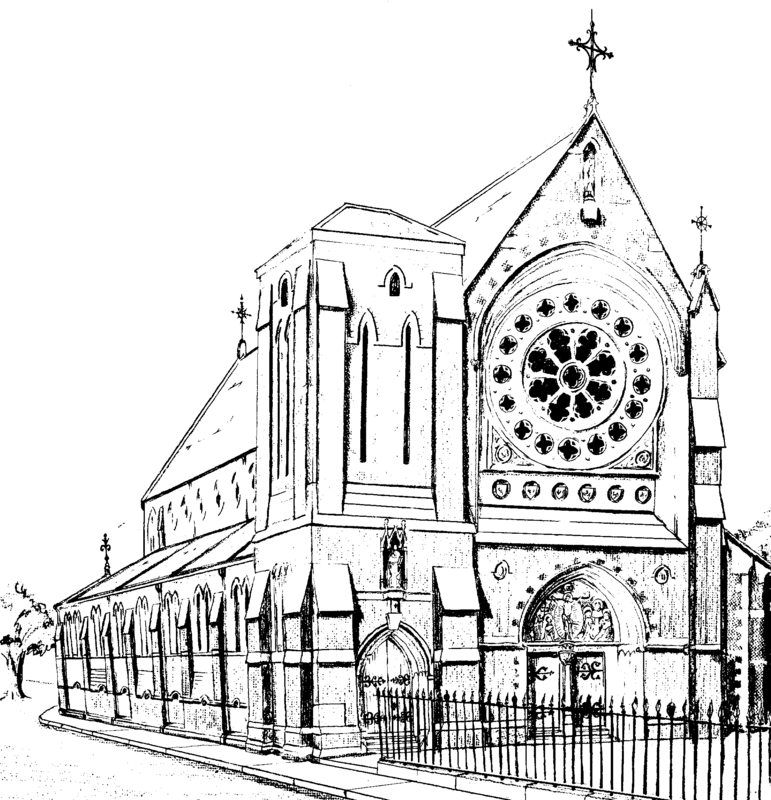 Money was vowed to the Order for it to help build a Church anew in Tralee and to this end John Mulchinock, became the great benefactor of the Church. Unfortunately he died before he could do much to help the founding of the present Holy Cross. In 1856 the newly appointed bishop, Dr David Moriarty, invited the Dominicans to setup a house. This was declined by the then Provincial of the Irish Province, Fr OP due to a problem that is extant today in the Irish Church - a shotage of priests to fill the house. The First Prior of the newly formed Holy Cross Priory was a Fr Pius Lynch OP. The chapel was a small room in 1 Day Place. In 1862 Fr Lynch was succeeded by Fr Thomas Rush OP as Prior of the Convent. He took up his position with great dynamism and the preparation for the building of the Church were set in earnest. With the help of some friends he obtained a bank loan of £2000 to purchase the present site on Day Place from Mr William Denny. He then engaged Mr George Ashlin RHA to prepare the plans for the Church. The builder is named as Mr Arthur Crosbie and the cost at about £6000. The cornerstone of the building was laid on 15th August 1866, the Feast of the Assumption, by Mrs Anne Jeffers, wife of the Benefactor. From the beginning, serious difficulties were encountered with the foundation. The Tralee Chronicle of the period recalls that 'the trenches and foundations would become submerged by the incoming tide, carrying everything before it and undoing, in a few moments, the work of weeks.' The contractor eventually overcame the elements by workiing night and day, and using inverted arches and a new material called concrete. No chances were taken with the tower. The foundation of it were taken down fifteen feet to solid rock. However, lack of funds would eventually prevent its completion.